WhatsApp has become an effective means of communication for us to interact with others on iPhone and other smart phones. Not only text messages, we can also send other types of information such as videos, pictures, audio messages as an attachment. However, losing such important WhatsApp messages and attachments can be a horrible thing due to mistaken deletion, system crash and other reasons. Don't be upset. In this article, we'll show you 2 effective ways to recover WhatsApp messages online for free on your iPhone. Move on to learn how to do it. Prior to restore WhatsApp messages online, please make sure you have synced your WhatsApp messages to iCloud. 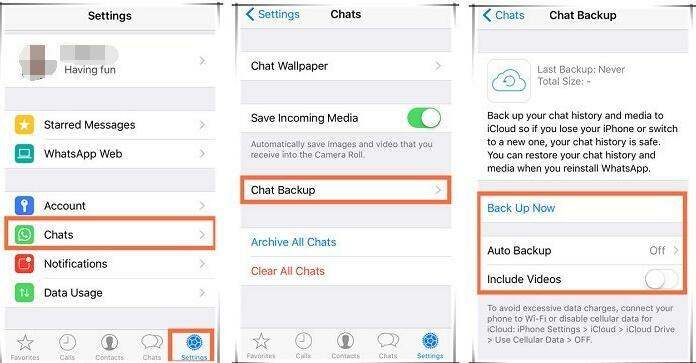 Simple go to "WhatsApp" > "Settings" > "Chats" > "Chat Backup" to have a check. Then uninstall it from your screen. Now go to App Store to reinstall it in your iPhone. Afterwards, complete WhatsApp setup and verify your phone number. Then a prompt will pop up and ask you to restore chat history. Tap the "Restore Chat History" option and wait until the restoring process is completed. Note: 1. Make sure you have entered the same phone number with that in the previous WhatsApp during the phone number verification. 2. Don't disconnect your Wi-Fi connection unless the restoring is finished. The other solution to recover WhatsApp messages online is to reset your iPhone to the factory settings and then restore iCloud backup on the premises that you have an iCloud backup file and it happen to have contain the lost or deleted WhatsApp messages you need. First of all, please go to the "Settings" > "General" > "Reset" > "Erase All Content and Settings" to factory reset your iPhone. Then enter the Apple ID and passcode and tap the "Erase iPhone" option to clear all data and media in your phone. Then follow the onscreen setup guide to reset your iPhone. 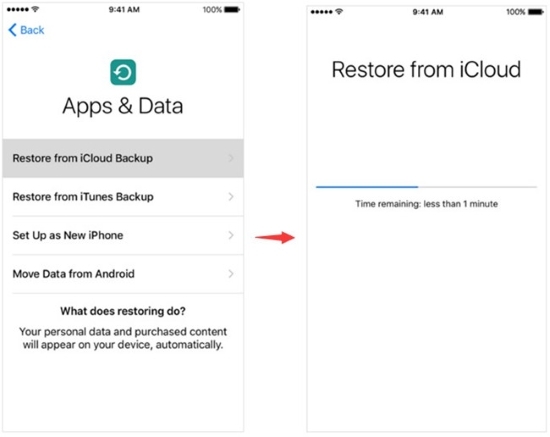 When you comes to the "Apps & Data" interface, tap the "Restore from iCloud Backup" and enter your iCloud account after entering username and password. Next choose the most relevant iCloud backup file to restore and wait a while and then you'll find your lost WhatsApp messages on your phone. Note: 1. Keep the Internet being access during the restoration. 2. You can back up your data before erasing all contents and settings in your iPhone. 3. If you find you've restored the wrong iCloud backup file, you can follow the same operation to restore another iCloud backup or the current backup. Now we have introduced two methods to recover WhatsApp messages online, however, both solutions exist some limitations such as lost newer data in your iPhone, cannot selectively recover the ones you desire, etc. And the most important point is, what if you have no any backup file? 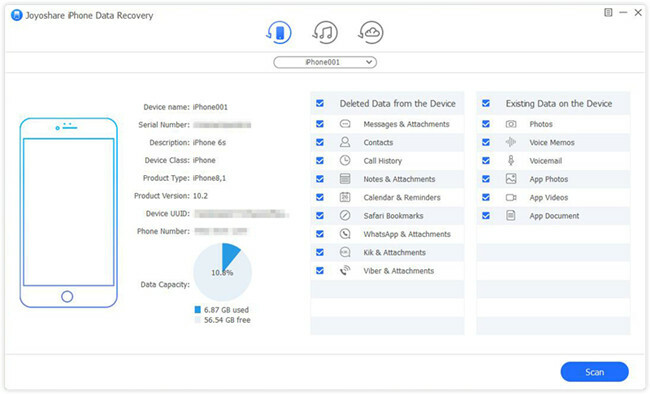 To help you resolve the problem on how to restore deleted WhatsApp messages without backup, here I strongly recommend you to use a professional third-party data recovery tool called Joyoshare iPhone Data Recovery, which is 100% reliable and powerful. 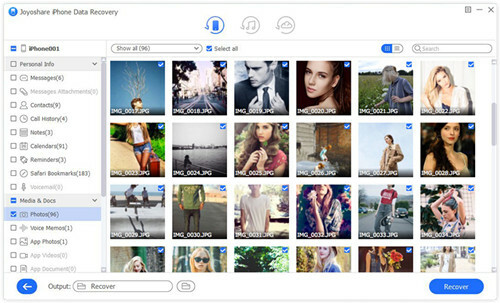 Besides WhatsApp messages, it supports to recover up to 20+ types of files including text messages, contacts, call history, notes, calendars, Viber messages, Kik messages, etc. Next let's move to the detailed guide on how to retrieve deleted WhatsApp messages without backup from iPhone under the help of Joyoshare iPhone Data Recovery in an easy and efficient way. 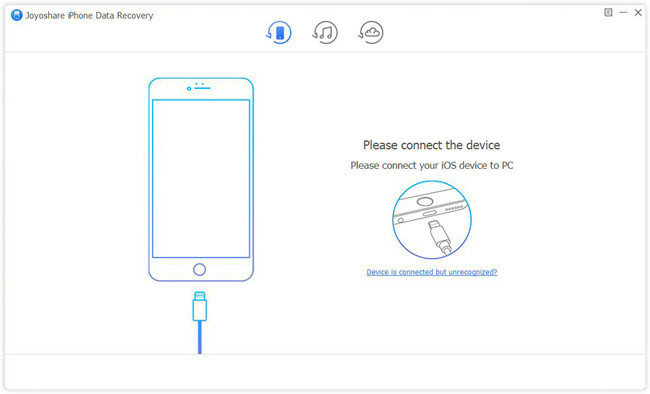 At first, you need to connect your iPhone to the PC or Mac with a USB cable. Then open Joyoshare iPhone Data Recovery on the desktop, and it will recognize your device automatically. After that, you'll enter the "Recover from iDevice" mode by default. Then select the file types that may possess your lost WhatsApp messages and attachments such as "Messages & Attachments", "WhatsApp & Attachments", etc. Click the "Scan" button to let Joyoshare start to scan your lost files. Once the scanning process comes to an end, you can preview the recoverable WhatsApp messages one by one. Choose the ones you want and then press the "Recover" button to export and save them onto your computer.